The beginning of the 20th century saw the birth of artistic firms producing high-quality jewellery that we still admire and crave for. Almost simultaneously in Europe and America, Tiffany, Cartier, Van Cleef & Arpels, Bulgari, Patek Philippe emerged. The industrial revolution on the one hand with its machines which made electric gold plating possible, and with the middle classes’ growing purchasing power, all helped to encourage jewellery manufacture at least in quantitive terms. And the quality didn’t really suffer either thanks to the artistic genius of the jewellers who appeared during this epoch. Charles Lewis Tiffany, for example, introduced the famous Tiffany diamond-setting process in England, and the English standard of sterling silver, which became a leader in jewellery production in America. In France, Alfred Cartier’s speciality was in fine platinum settings to highlight the purest precious stones. His firm supplied jewels to the king of Portugal and Prince of Wales. Another example is René Lalique with his love of semi-precious stones and even glass jewellery that his contemporaries compared to Renaissance creations. 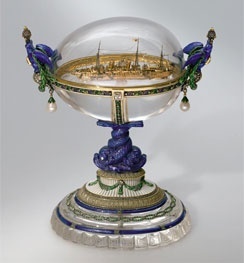 The firm of Peter Carl Fabergé was one of the oldest of its kind in the world. It was founded in St Petersburg. Karl Gustavovich Fabergé, son of an established jeweller in Russia, was educated in fine arts in Germany, Italy, France and England. Having inherited his father’s business at the age of twenty four in 1870 he began to manufacture not only conventional jewellery, but also objects of fantasy—using a huge variety of precious and semiprecious metals and gems such as gold, silver, malachite, jade, lapis lazuli and others. The range of the styles he favoured was impressive. He had a liking for the Louis XVI style, but he also made objects in the styles of the Italian Renaissance, Rococo or Old Russian mixing Baroque and Byzantine in one. Another specialty of Fabergé was enamelling. A great virtuoso in styles, techniques and textures, Karl Gustovich won prize after prize at the Pan-Russian exhibitions 1882 in Moscow, and the Universal Exposition in Paris in 1900, gaining a real reputation among the European and in particular Russian royalty. His workshop was famous for his exquisite flowers, bibelots, animals and above all his imperial Easter eggs—the delight of several Russian emperors and their kinship in Europe over the span of several decades. 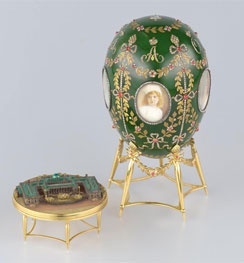 Emperor Alexander III commissioned the first of the eggs for Tsarina Maria in 1884. His son, Nicholas II, continued the tradition, and placed an order for Fabergé to create Easter presents every year for his mother and Tsarina Alexandra. For Christel McCanless, a co-author with Will Lowes of the book Fabergé Eggs: a Retrospective Encyclopedia, published in 2001, many of Fabergé items and eggs in particular “have wonderful historical associations” which makes their story more intriguing with all the unsurpassed workmanship embodied in them. It is known that between 1885 and 1917, 66 eggs were manufactured in total. Each was unique in design and in concept, with exquisite miniatures craved into them, some functioned as clocks. The Hen Egg, the very first order by Alexander III, was crafted from gold. The white-enamel shell opens to reveal a gold-yellow yolk that in turn reveals a multi-coloured tiny hen to hide another surprise inside: a diamond replica of the Imperial Crown and a small ruby pendant. According to the Fabergé tradition, not even the Tsar would know what the eggs would be made from and what surprises they would contain. It took a long time to produce some of the miniatures. The Coronation Egg contains an exact replica of the Tsar’s coronation coach. The 1900 Egg was made to commemorate the completion of the construction of the Trans-Siberian Railway and contained a miniature model of the railway. The latter took over a year to make. The last two eggs on which the Fabergé masters were working in 1917 were the Karelian Birch Egg and the Blue Constellation Egg. They were not finished and their whereabouts are unknown. The year of 1917 with its October Revolution was the last year for Fabergé and his family in Russia. The main shop in St Petersburg (Petrograd then) was closed and the whole enterprise was nationalized. The Bolsheviks spared the Fabergé family their lives but actually deprived them of their joy for life. Karl Gustovich, having reached Switzerland, could not suffer his loss and forced emigration and actually died of a heart attack several years later in Lausanne. His sons tried to keep the tradition alive, but lacking both employees and resources, they failed. The Soviet State accumulated a lot of Fabergé pieces after the Revolution and sold them to foreign buyers by weight when they especially desperately needed foreign currency. There is no consensus of opinion as to how many pieces of jewellery the Fabergé firm produced: estimates run from 120,000 to 500,000. There was no united catalogue as with that of the Cartier firm, for example. In the 1920s and 1930s, most of the Fabergé’s creations were to be found in the West. Since the 1930s, about 20,000 Fabergé items have been presented at auctions. Approximately two thirds have found their owners and are not for sale whereas the rest still appear at auctions from time to time. Two antiques galleries were the first principal buyers for Fabergé, and some time later these became main resellers. These were: A La Vieille Russie in New York and Wartski in London. Actually they managed to maintain the interest of the already non-existent firm among potential buyers. One of them was Malcolm Forbes who was the first to systematically purchase Fabergé items for a regular collection. He called himself ironically a “Fabergé bug” and during his life he collected more than 300 items. 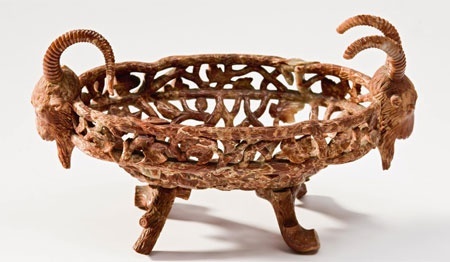 As it is known, several years ago the Viktor Vekselberg’s foundation bought the whole Forbes collection at Sotheby’s in its entirety including the nine Emperor Eggs. The deal value was not disclosed but today, it is estimated to be worth between US$130-US$250 million. The collection was not allocated to any state museum in Russia as it was reported by the media in 2009. But Vekselberg has plans to construct and open museums in Moscow and Saint Petersburg to display the Fabergé treasures next year. It is clear that the Fabergé market is one of the most attractive for those dealing with Russian art. A triple record was set at Christie’s four years ago, when the 1902 Rothschild egg was sold for £8.9 million and became the most expensive piece, Russian object and Fabergé object ever sold at auction. It was bought by a Russian Alexander Ivanov, the director of the Russian National Museum in Moscow and the first ever Fabergé museum located in Baden-Baden, Germany. Ivanov claims to possess the biggest collection of Fabergé items in the world: up to three hundred pieces. Alexey Denisov-Uralsky and Avenir Sumin, and also masterpieces from Cartier. The exhibits unite in one concept to depict the evolution of jewellery in Russia in the 19th century and its interaction the western traditions. Jewellery on show are from the Hermitage Museum, the Cartier Archive, the A. Fersman Mineralogical Museum, Omsk Vrubel Museum and the St Petersburg Mining Museum.